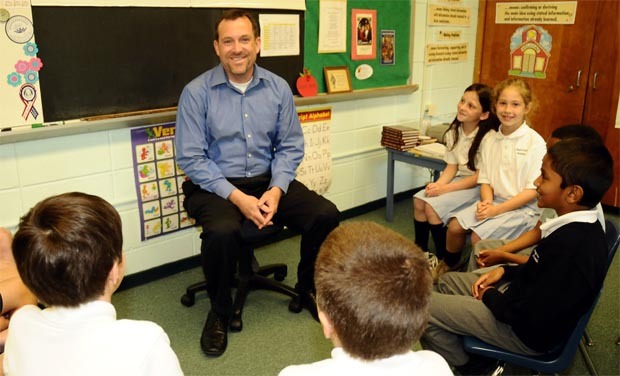 Patrick Reilly, president and CEO of the Cardinal Newman Society, visits with fourth graders of Regina Coeli Academy in Abington. Regina Coeli Academy in Abington hosted its annual “Stand Up for the Children” event May 13 at Normandy Farm and Conference Center in Blue Bell. The guest speaker was Patrick Reilly, president and CEO of the Cardinal Newman Society, which advocates for Catholic education. His talk “Catholic Education: Hope for Family and Religious Freedom” focused on the increasing challenges to families and religious freedom in contemporary society, including cultural, governmental and educational factors. He offered hope in reversing these challenges by highlighting the renewal in Catholic education that is happening today at Catholic schools such as Regina Coeli Academy and schools in dioceses across the country. Prior to the evening event Reilly toured Regina Coeli’s Catholic, classical academy during an open house. He also met with prospective families and visited classes in session. The school recently announced it will expand its preschool program this fall by providing a pre-K and Kindergarten Montessori program led by accredited Montessori faculty. Regina Coeli Academy’s Children’s House offers half-day and full-day programs for young children ages 3 through 4 years and a full day for children ages 5 and 6. For more information about Regina Coeli Academy’s Children’s House, visit the website or call 215-277-1386.